I don’t even know where to begin on this one. First of all, it’s a day late. This “vacation” has really messed up my sense of time. You know that Chinese fortune/curse, “May you live in interesting times”? It kind of feels like that here lately. We’ve had some major things go wrong this month – Hubby’s laptop died, we both got sick the week of Christmas, the water heater had to be replaced thanks to a leak that had been going on for I don’t know how long, and I’ve busted another phone screen. We’ve had to reschedule the Christmas get-together with my in-laws twice now, and we will have to go see Gigi separately, but it did mean that we got to spend Christmas day at home. We spent half the day Christmas Eve at the clinic (strep throat for me, flu for hubby,) and Jellybean didn’t nap, so we laid around and watched a lot of Winnie the Pooh, Kipper the Dog and Pocoyo cartoons. (Jellybean is also growing his 2-year molars, so sleeping can be difficult.) On Christmas Eve, I was so sick, and so tired and so… just… OVER IT. But Christmas morning came and Hubs was feeling much better, I was feeling a bit better and Jellybean still wasn’t sick. We opened gifts, had breakfast and spent the day lounging together. We had our traditional Christmas Eve lasagna dinner for Christmas dinner instead and it was awesome. In all of the chaos, though, we’ve been able to spend some time as a family. Thanks to the water heater, and a very fun Christmas present for Jellybean, Hubs and I got to have some actual conversation while doing the dishes. We’ve all spent hours in the floor running a little hippo, lion, monkey and elephant down a long track, building duplo trains and working puzzles. Jellybean has figured out all kinds of stuff, no doubt due in part to watching his cousins play and be crazy Saturday. I did get to finish all my Christmas gifts on time. Since we haven’t had all our gatherings, I can’t show you details on everything, but I can show you a few things. Look at that stack of knitting! Last year, my sister-in-law and I had this discussion over what to do for their kids. They have two girls and a boy, and they all love Mickey and Minnie Mouse. 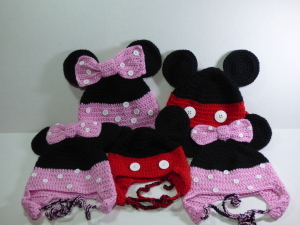 I ended up making the girls Minnie hats and a Mickey hat for my nephew. They loved them. So much so that I was asked to make larger ones this year since they had outgrown last years’ hats. 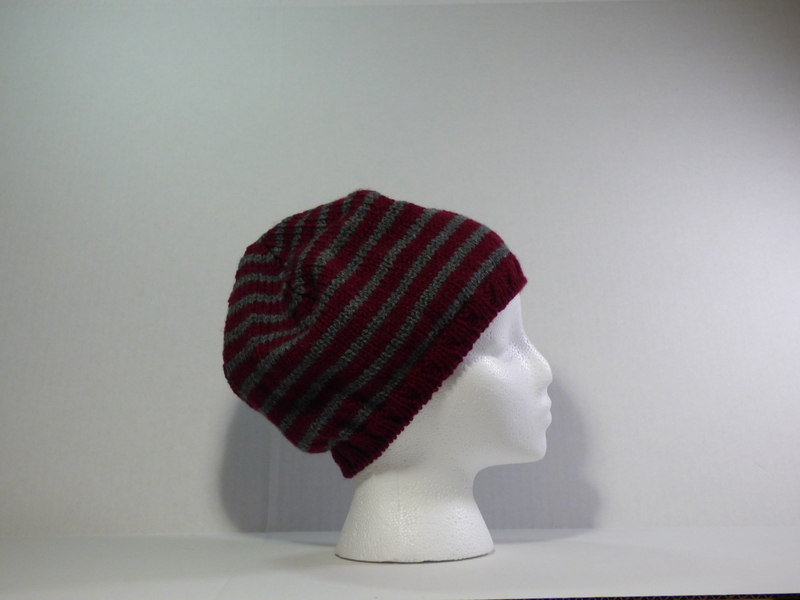 Well, with my tendency to over do everything, I made hats for all five of them. They do a family costume for Halloween every year, so I knew my brother and sister-in-law are team-players, and I knew they would enjoy having a family of hats. I do love making things people will enjoy and will use, but having made a total of 8 Mickey and Minnie hats, we need to come up with something else next year. I’m sick of making all those ears! Ha ha! I used Repeat Crafter Me’s Mickey and Minnie Mouse Crochet Hat Pattern for the basic idea, but I just realized that I didn’t follow any of that pattern at all. I used her Crochet Owl Hat in Newborn – Adult Sizes for the base hat. The instructions for the ears didn’t work out after about 3 rounds, so I changed those, then I had to make larger bows and I made a crochet chain for each of the earflap ties. 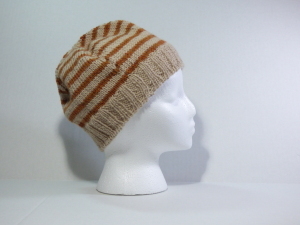 Next up are hats for my teenage cousins. I made a slouchy version of Jared Flood’s Turn a Square hat in their school colors. Now, I know how teenagers are and I know that these hats may not get much use, but I feel like gift giving is as much for the giver as it is for the recipient and I wanted to make them something they could use if they choose. I have watched these two grow up from tiny babies and I have to say that they have really grown into fine young people. I also made head covers for my Aunt and Uncle. Last year, my uncle was the only one in his family that DIDN’T get a hat, and he made sure I knew it. His was the first Christmas gift I finished this year – I made it in July. It’s also a Turn a Square hat. 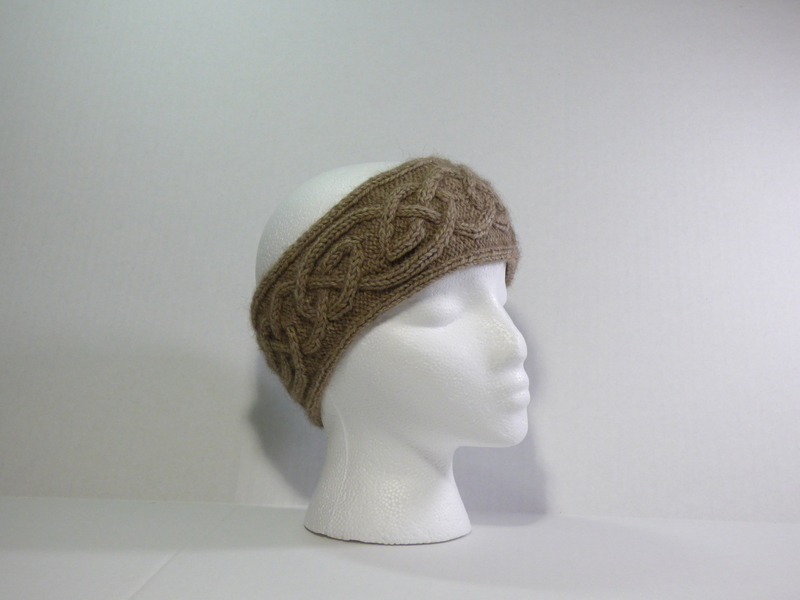 My Aunt got a headband from Lucy Hague’s Cinioch pattern (which I just LOVE, let me tell you!) and I may have to make myself one of those, too. Then that leaves my Mom and Dad. 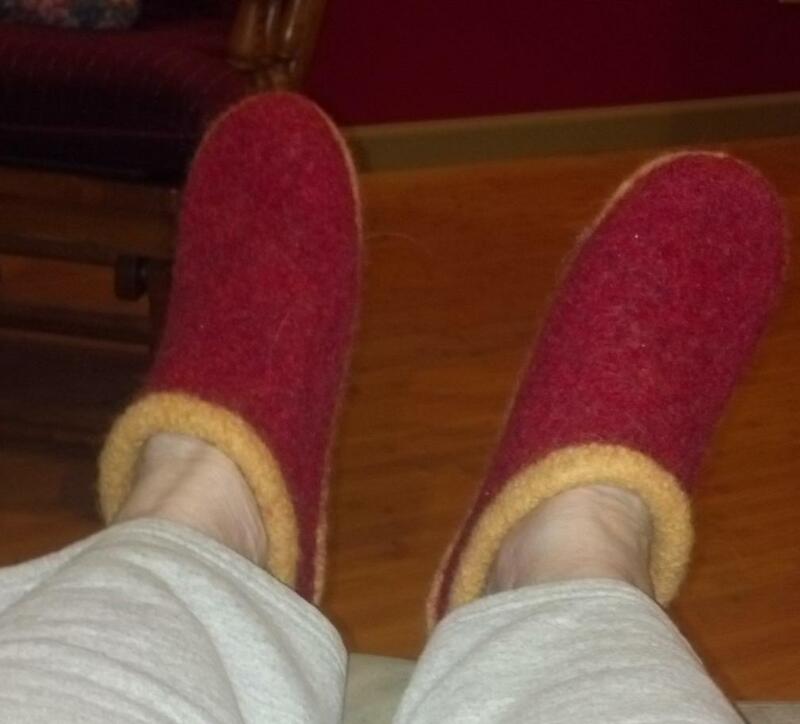 When I made myself the felted slippers, Mom commented on the blog post and (not-so-subtly) hinted that she might like a pair. How can I not oblige? I know my Dad has cold feet, too, so this was the perfect gift for them. 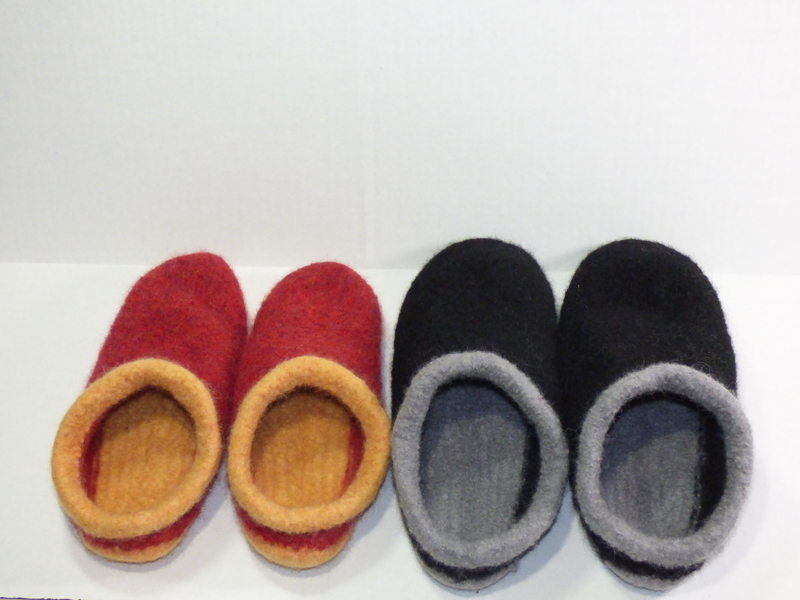 I made Mom’s in red and yellow, her favorite colors, and I made Dad’s in a perfectly manly black and gray. I got each of them to sneak a look at the other’s shoe size and managed to felt them just right. I admit, after the felting disaster for Jellybean’s slippers, I was more than a little nervous, but I stopped the machine and measured the inside of the foot every 5 minutes and I got it just right enough. The pattern is Fiber Trends Felt Clogs. This pattern is so genius in the way it’s constructed. I love it and haven’t minded making 5 pairs. Mom loves her shoes and has worn them every day. I’ve been told that Dad loves his shoes, too. THAT is just about the best compliment I could possibly get. I still have three more things to show you, but that will have to wait until after our next family gathering. We are currently planning that for the weekend, so I should be able to show you those next week. Of course, the two people who got left out of all this holiday knitting are Hubby and Jellybean. 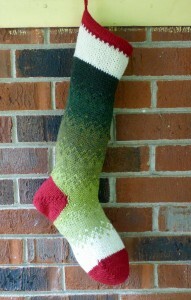 I felt really guilty about that until I remembered that I made stockings. Oh yeah, I did make them something for Christmas, they just don’t get to open a knitted surprise this year. 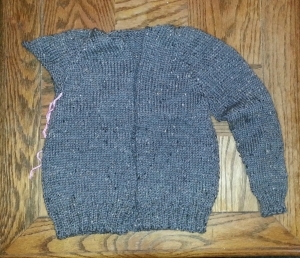 After I finished all the bits & pieces of everyone else’s gifts, I got right to work on Jellybean’s winter sweater. I cast on Christmas day and last night I bound off on the first sleeve. (That’s why this post is late, actually, I spent yesterday’s naptime knitting instead of blogging.) I have one more sleeve, then the collar and button bands to do and he’ll have a new sweater. It’s looking very handsome and I’m very excited about it. It’s about time to get it done, too, since it’s getting colder these days. The stockinette is a chore, for sure, but it’s easy to do while watching TV or having a conversation and it’s really gone quickly. I already have ideas on what I will do for next year’s winter sweater. 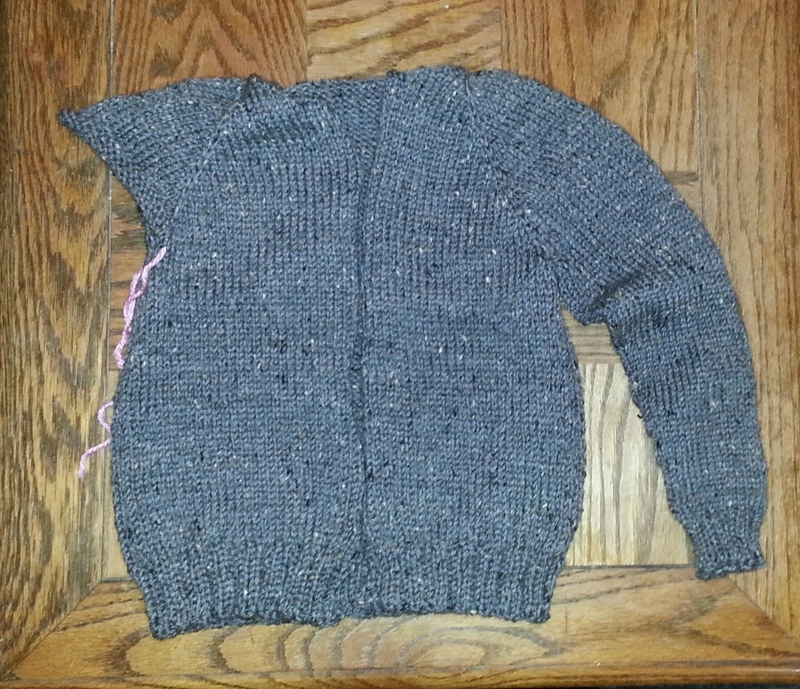 Cables and seed stitch and ribbing, oh my! Hopefully I can plan better and get started on it earlier. Have a great week and a very Happy (and safe!) New Year! 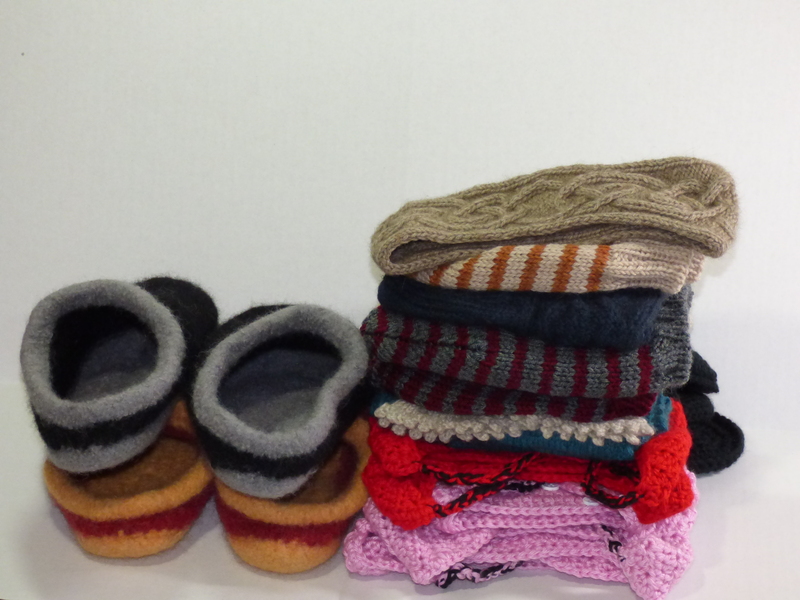 I have only three hats to sew pieces onto and two things to felt. We have two family celebrations, one with my husband’s family on Christmas day and then one with my family on the Saturday after. In the past, I’ve had to finish up stuff for the later celebration AFTER Christmas, but this year, I plan to be knitting for myself that last week of the year. Except…. I don’t feel well. I was talking to Mom yesterday, and telling her that I just hoped we were all well for Christmas. Pretty sure I jinxed myself. Yesterday evening I started getting achy – first my lower back, then my hips, knees, shoulders, elbows and so on. I spent the night trying to sleep with the heated mattress pad turned way up and still hurting and shivering. I don’t have a fever (I may have had one last night, though) and Ibuprofen is helping with the aches, so Jellybean and I were able to get some errands and a quick park trip done this morning. Hopefully the aches will remain at bay long enough for me to get everything finished and hopefully I don’t get any worse. The next two days will be spent gathering last minute gifts and putting the final touches on everything. I’m looking forward to spending some quality time with all my family. I’m excited to stack up all my holiday hand-knits and take a photo. It’ll be great to see everything in one spot. Gotta do that soon, though, so I can get them all wrapped up! And with that, dear readers, I must go work on finishing up the last few details. Head down, nose to the grindstone, don’t look up, don’t think about how much time is left, just knit. That’s been my motto for the last week or so. I know it’s Monday because DH went back to work today. Otherwise, I haven’t really looked at the calendar. These days, it’s typical of me to not know what day it is with a very busy toddler around, but right now, I’m actively trying to avoid it. Oh, wait… I keep forgetting about that one. But it’s a quickie. I should probably jot that down on my master list so I stop forgetting it. I’m going to go knit.